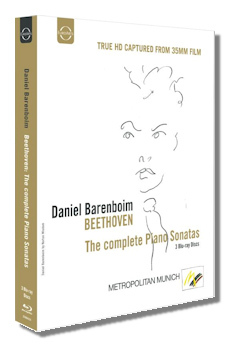 Daniel Barenboim, who first established himself as a great pianist then as a great conductor who still regularly plays the piano, recorded these sonatas in Vienna in 1983 and 1984. Surprisingly, the sound reproduction is quite vivid and nearly competitive with today's better piano recordings. The picture quality is quite fine too, though the color richness may be a degree or so lacking alongside current video productions. The camera work is excellent throughout all thirty-two sonatas. Barenboim is strong in just about every work here. Naturally, some listeners may quibble over a few details here and there, but for the most part they will find these performances thoroughly compelling. From the Mozartian 1st Sonata to the ecstatic and complex 32nd, Barenboim captures Beethoven's expressive soul unerringly, it seems. The early sonatas sparkle with youthful vigor, while the middle ones show the composer's maturation process and development toward greater depth. The later efforts brim with a sense of both profundity and bold discovery while presenting greater technical demands – demands Barenboim easily meets. To cite notable performances here might suggest some of Barenboim's efforts are by comparison less worthy than others, but there's a level of consistency here that holds for all the works. As suggested I've found none of the performances less than convincing. I developed a greater appreciation for #3, as Barenboim catches all the youthful playfulness as well as the work's deeper moments, particularly the soul of the dark Adagio second movement. His 4th is right on target in every movement. Barenboim even makes the 1st, which opens with a theme suspiciously similar to one in the first movement of the Mozart 25th Symphony, sound very convincing. To me one test of a pianist's interpretive skills comes in the 6th Sonata's finale: if you can capture the humor and playfulness at Beethoven's presto marking without making the music sound stiff or rushed, you're truly gifted. Barenboim passes the test convincingly. Brendel and some others sound a bit inflexible here, while Arrau finds the humor alright, but with a decidedly relaxed, and thus questionable tempo. The Pathétique (#8) brims with tension and a sense of the ominous in the opening panel, but the second movement appropriately is lovely and consoling, while the finale is spirited and energetic. The Ninth is dramatic and muscular, a very convincing performance of this early masterpiece. Barenboim effectively captures the range of emotions in #12, from the stately and playful moods in the first movement variations to the brighter but anxious character of the ensuing Scherzo; and from the dark solemnity of the third movement funeral march to the sunny energy and triumph of the finale. Barenboim's Moonlight Sonata (#14) features a very effective and relatively brisk first movement (too many pianists drag the music here) and follows with a bright second movement and lively but ominous finale. A most brilliant performance! The Pastoral (#15) is given an effective reading, not least because Barenboim dredges up some dark elements in the second movement Andante. The Tempest Sonata (#17) is stormy and threatening and quite powerful. The four note motif that permeates the finale rings out with ominous portent here to round out a gripping performance. The charm, humor and elegance in #18 are deftly captured by Barenboim and he makes the most of Nos. 19 and 20, slight works which, despite their numbering, predate the 1795 First Sonata by three years. The great Waldstein Sonata (#21) gets a fairly straightforward performance where Barenboim's dynamics feature many gradations, tempos are judicious, and the music's drama comes through with impact. In sum, it's a slightly understated but effective performance. The second disc closes with the Appassionata Sonata (#23) and Barenboim's reading is solid and convincing, if a bit rushed and hectic in the finale. Barenboim's #25 is sprightly and charming though slightly hard-toned in places. The ensuing Les Adieux Sonata comes across elegantly and with its range of emotions captured effectively by Barenboim. The heartrending "absence" of the second movement is quite touching here. Among the sonatas from Beethoven's last period, of course, is the towering Hammerklavier (#29). Barenboim offers a dramatic, tension-filled performance that captures the epic and complex character of this mighty work. In many ways this sonata plays into Barenboim's strengths: the first movement's monumentality is well served by the pianist's powerful fortes and muscular style. The challenging fugue comprising most of the finale is also splendidly played by Barenboim, with much often buried detail clearly emerging. The timing of 15:45 listed in the booklet for the Scherzo is, of course, way off: the movement here lasts just under three minutes. The last three sonatas also draw fine efforts from Barenboim. The fugal finale in #31 is especially convincing, and #32 comes across as the profound and ecstatic work it is. Barenboim is able to make the second (and final) movement that special sublime journey toward and arrival at paradise. Barenboim first recorded the complete Beethoven sonatas for EMI in 1966-69 and, after this Vienna effort, he made another set for EMI in 2005. There is also a 1984 complete set of Beethoven sonatas by him on a Deutsche Grammophon CD set (reissued in 1999, 463127-2 B00002DEH0). Has anybody recorded the Beethoven sonatas complete more often than Barenboim? Brendel has done three complete sets also and has probably done the cycle in concert as often too, I would surmise. I've heard performances from some of Barenboim's other cycles but can only speak with authority on this EuroArts Blu-ray effort. Of course, we have excellent Beethoven sonata sets from the aforementioned Brendel, Ashkenazy, Arrau, Schnabel, Richard Goode, and many others. Who's the best? I won't go there (who can when there are dozens of competing complete sets? ), though I will say Barenboim here is excellent, presenting Beethoven with more meat on his bones than you generally hear, in fairly straightforward readings that reveal the composer with a more Romantic-school, more muscular approach. That said, Barenboim doesn't slight the Classical side of Beethoven either; neither does he eschew or mishandle the more delicate, leaner elements in the music. After each sonata, credits appear on the screen listing the director, cameraman, sound engineer and others involved in the production. Next, the sonata that follows is listed and then Barenboim proceeds to perform it. Worth noting in relation to Barenboim's performance demeanor is that he never hums or makes distracting faces or throws his hands about wildly or attempts any other acts of physical showmanship. He simply plays the music – and plays it astonishingly well. The locations of the performances are listed in the heading above and most are in Austrian palaces where there are stunningly beautiful décor and artwork. The whole production has a regal air about it, a sense you're experiencing the era of the music, though Beethoven's personal circumstances hardly allowed for the lavish amenities associated with these palaces. Yet, one might argue the great music is worthy of the surroundings, and while that is certainly true some of its more earthy and humorous moments might seem a little out of place. There is a bonus feature that offers a nearly ten-minute interview with Daniel Barenboim in German with subtitles, from 2012. In sum, this production is topnotch in every respect, most importantly in the performances. Strongly recommended!